New research into lunar crater-counting shows that the overall average of volunteers is very close to the average of the eight professionals who also examined this region of the lunar surface. The results indicate that crowdsourcing projects like those conducted through CosmoQuest can be used to effectively gather more data than previously thought possible. Regarding the results, Robbins said, “The new research points out that crowdsourcing is a viable way to do planetary science. A very large group of volunteers was able to chart these features on the Moon just as well as professional researchers. “We now have evidence that we can use the power of crowdsourcing to gather more reliable data from the Moon than we ever thought possible,” Robbins added. A paper on the subject was published online March 4 in the journal Icarus. Developed by Southern Illinois University Edwardsville (SIUE) assistant professor and study co-author Pamela Gay, CosmoQuest is a volunteer-based project that trains the public to identify craters, and includes educational features, forums, blogs, online hangouts, and galleries. For this study, several images of small portions of the Moon were put online and both planetary science professionals and citizen scientists were asked to identify craters in the images that were at least 18 or more pixels, the equivalent of 35 feet, or 11 meters, in diameter. The area of the high-resolution images under study by the crater counters was about 1.4 square miles, or roughly the area of 1,000 football fields. 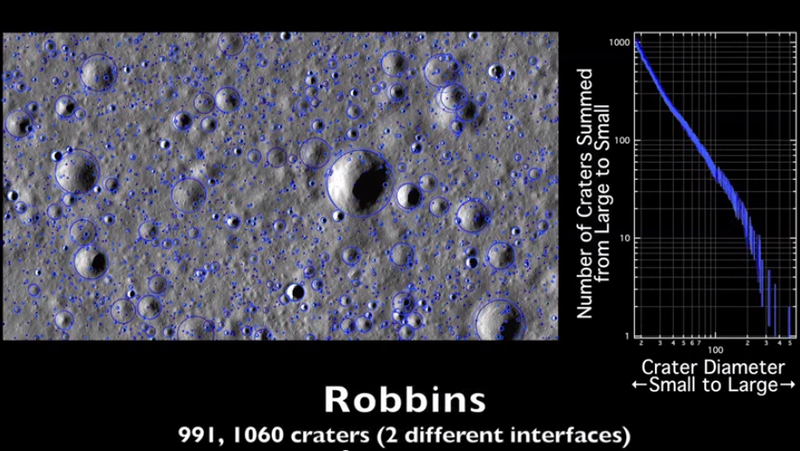 The variation among individuals counting craters can be substantial for both experts and volunteers, but when averaged by group, the population of craters found by the experts and citizen scientists were statistically similar. 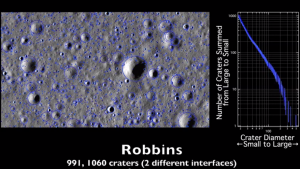 Robbins will present the results during a session on “Craters: Inventory, Imagery, and Morphology” at the 45th Lunar and Planetary Science Conference in The Woodlands, Texas on Tuesday, March 18, 2014 at 6:00 p.m. in the Town Center Exhibit Area.